The Florida Keys, dubbed the "American Caribbean," is an archipelago off the southernmost tip of Florida stretching between the Atlantic Ocean and the Gulf of Mexico. Unlike mainland Florida, the islands of the Keys have a true tropical climate, with hot, humid, rainy summers and somewhat drier, warm winters. In other words, it's snake paradise. Of the 46 snake species native to Florida, almost half inhabit the Keys. Further, scientists have recently noted an influx of non-native invasive species. Terrestrial snakes are the most numerous species in the Florida Keys, inhabiting forests, pine lands, dense waterside vegetation, mangrove thickets and gardens. Most are nonvenomous, although all are capable of inflicting painful bites if threatened. Red corn snakes are tan, brown or orange with bright red-orange blotches outlined in black. Excellent climbers, they're often found in trees, residential barns or attics. Rough green snakes are slim reptiles with bright green bodies and yellow-white bellies. They favor moist, densely vegetated areas, where they feast on caterpillars, spiders, insects and treefrogs. Other common terrestrial snakes include black racers, scarlet king snakes, Florida brown snakes, eastern indigo snakes and ring-necked snakes. Three species of water snakes are native to the Florida Keys. All are nonvenomous. They enjoy similar diets of aquatic lifeforms like fish, tadpoles, frogs and salamanders. Southern or banded water snakes are yellow-tan to gray-brown with brown banding. They favor freshwater lakes, ponds, marshes and swamps. Salt marsh water snakes occur in gray with brown stripes, or in solid black, red-orange or olive-brown. Only the solid-colored species live in the Keys, inhabiting brackish and salt water marshes, tidal flats and mangrove swamps. Florida green water snakes are solid brown or dark olive with pale bellies. Although occasionally found in brackish marshes, they typically inhabit freshwater habitats surrounded by dense vegetation. Four venomous snakes haunt the Florida Keys. Cottonmouths inhabit coastal marshes, swamps, lakes and wet prairies. These thick-bodied pit vipers are typically red-brown, gray-brown or black. Juveniles have dark bands that fade with age. Distinctly marked by red, yellow and black bands, coral snakes inhabit dry pinewoods or hardwood hammocks. They spend most of their time hiding underground or in ground litter. Eastern diamondback rattlesnakes are gray, tan or brown, marked with rows of distinct, cream-lined diamond shapes. Their tails are tipped with large rattles. They inhabit dry forested areas, avoiding wet swamp and marsh regions. Pygmy rattlesnakes have thick, gray bodies with dark gray, black and red splotches. Their tails are tipped with small rattles. They occur in a variety of habitats from dry forests to marshlands and are the most commonly encountered venomous snake in urbanized or residential areas. 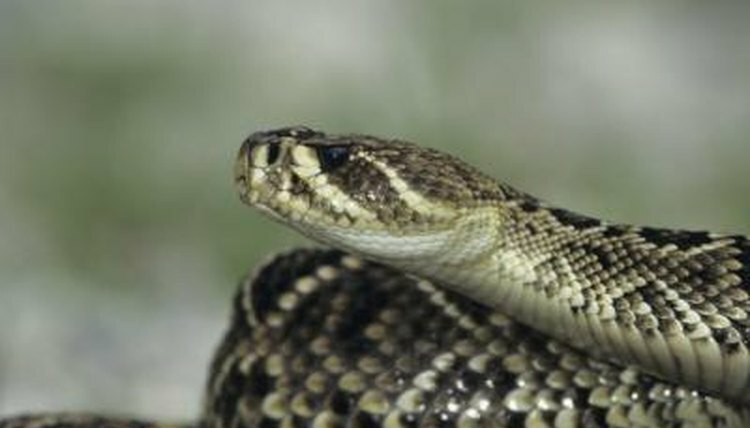 According to the Fort Collins Science Center website, scientists have recently noted the presence of several non-native, invasive snake species in southern Florida. Invasive populations typically occur when pet snakes escape or are illegally released. Problems arise when these non-native snakes begin to breed and establish large populations. They can spread disease to native species, pets and humans, use up natural resources and prey upon native species. Three invasive species have been observed in the Florida Keys: red-tailed boa constrictors, Brahminy blind snakes and Burmese pythons. The Florida Keys -- Key West: What Are the Florida Keys?